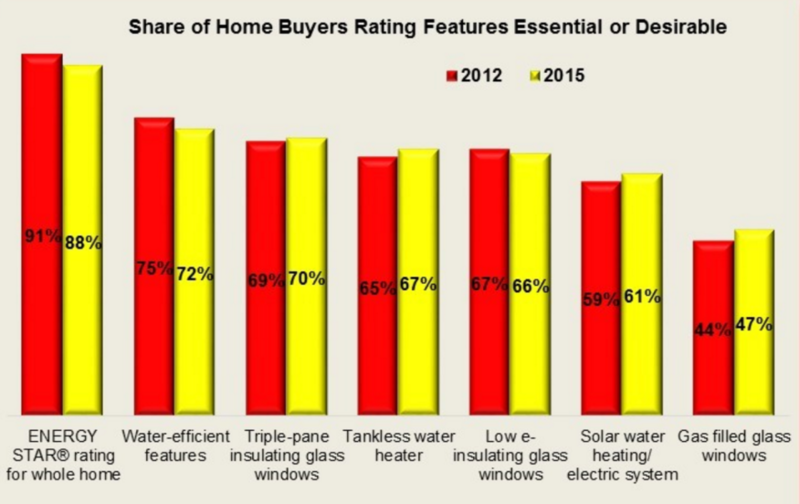 NAHB economist Paul Emrath discusses the results of the latest NAHB home buyer preference survey, in which buyers responded that they still prefer green features in homes and are willing to pay more up front to save on future utility bills. ENERGY STAR® rated appliances ranked second from the top among 150 different home and community features that respondents were able to rank. The trend for green features remains stable–preferences for particular green features in 2015 were about the same as they were in 2007 and 2012. Three of the green features were also rated on this scale in the previous two iterations of the survey (conducted in 2007 and 2012). In 2015, 90% of home buyers rated ENERGY STAR® appliances essential or desirable, and 87% gave this rating to ENERGY STAR® windows. The percentages for these two features were very similar in 2007 and 2012. 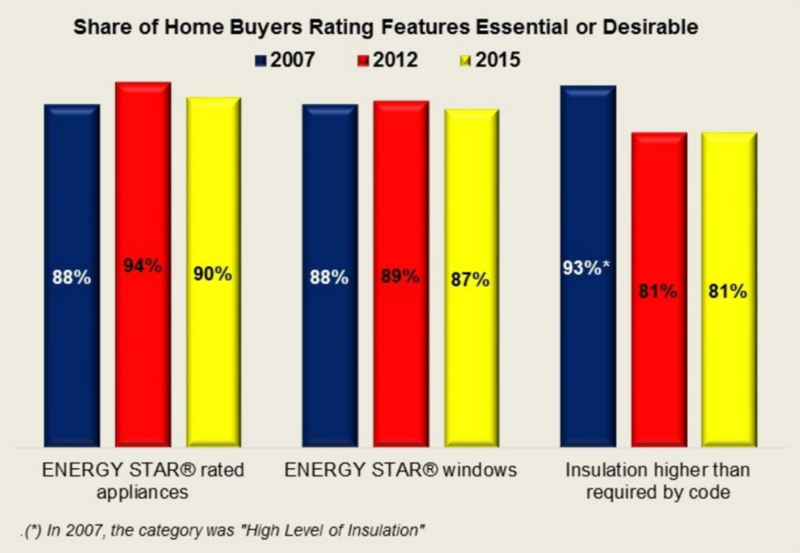 In 2015, ENERGY STAR® appliances, an ENERGY STAR® rating for the whole home, ENERGY STAR® windows, and above-code insulation all ranked among the 10 most popular of the 150 home and community features rated on the four-tier scale. The least popular of the green features was gas (argon or krypton) filled insulating glass in windows. Over the relatively short span between 2012 and 2015, buyer preferences for each of these green features remained quite stable. 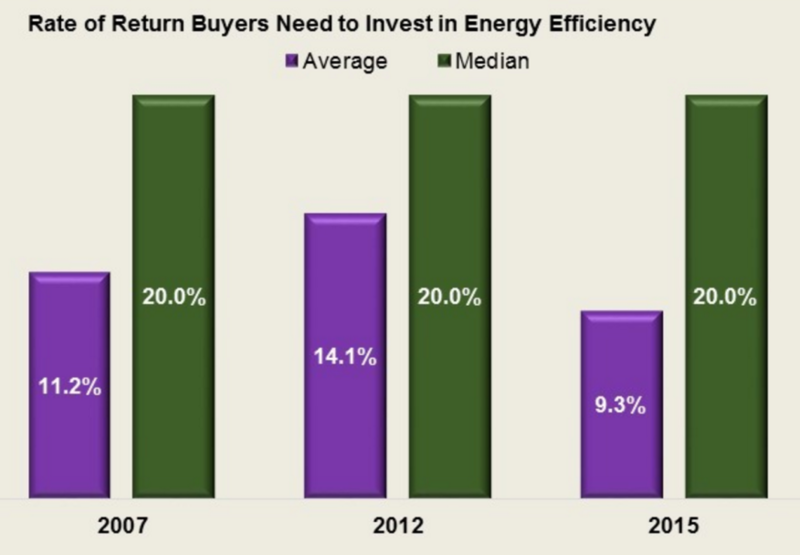 In terms of the return on investment required for buyers to feel like energy efficient home features are worth the up front price, the median among survey respondents stayed at 20% in 2007, 2012, and 2015. The average rate of return, 9.3%, is sensitive to a small share of respondents willing to pay large sums of money up front, but is still a lower rate than reported in 2012 and 2007, showing that some buyers are considering long-term benefits of sustainable features.